If you get a notification stating that the attempted payment for your Xbox subscription was declined due to an outstanding balance, you’ll need to pay the balance owed before you can renew your subscription. Note If your Xbox subscription has been suspended, see Your Xbox subscription is suspended. Under Next charge, select Pay now for the subscription with the past due balance. 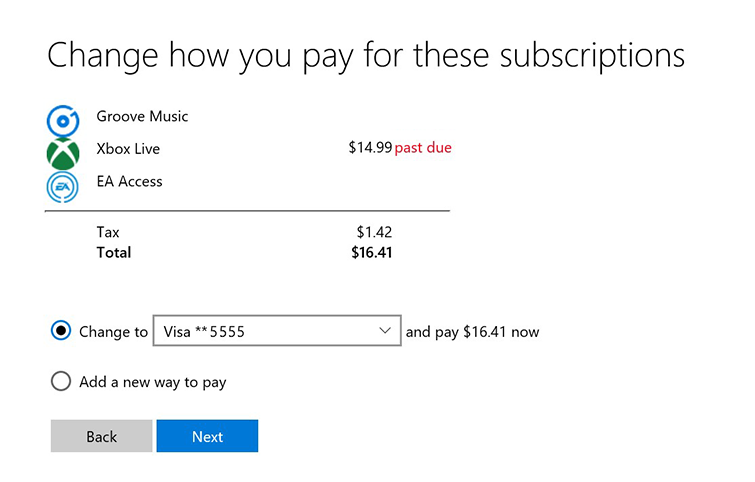 On the “Change how you pay for these subscriptions" page, select the payment option you want to change from the dropdown list. Note To add a new payment option, select Add a new way to pay, select Next, and then follow the steps to set up your credit card, debit card, or PayPal account as a new payment option. Would you like to contact Support regarding the "The payment for your Xbox subscription was declined" issue you were reading about or a different issue?